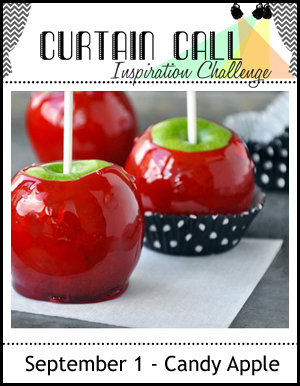 When I saw the inspiration for this week's Mix it Up challenge, I knew just what I'd use! I am not a cat person, but who could resist that sweet face? Since it's the end of the month, our theme is Anything Goes. The DT are all playing with Spellbinders products. We'd love to see you using them, too, if you have any! I simply stamped and heat-embossed the stamp right onto the board design paper, and then colored it in rose, periwinkle, and green. I stamped it a 2nd time so that I could cut out the roses and pop them up above the card. This sentiment has lots of personal meaning to me, and Tammy has illustrated it beautifully! I inked up the smooth side of the embossing folder with 3 distress inks randomly, then spritzed it with water, inserted my watercolor paper on top, closed the folder, and ran it through my Cuttlebug. This embosses the panel and smooshes the inks all around the design. I love how this combination of colors blended! I must tell you that this embossing folder is very thick, and I couldn't get it to work the usual way in my little old Cuttlebug, (the usual sandwich was way too thick to fit), but I managed to figure out my own combination of plates, with a rubber mat thrown in, too. The first theme for Concord & 9th's Where Creativity Meets C9 challenge is "Celebration". I don't have many Concord & 9th products yet, but since I love fall and want to celebrate it, I thought I'd pull out my first C&9th product called Take A Bough, and make an autumn tree. I started with an 8 1/2" X 11" piece of thick white cardstock, and sponged on 4 or 5 different yellows to reds distress inks, then cut my branches and constructed them just as I've done before. After they were threaded onto a wood skewer, I inserted it into a wood slice as a base. It stands about 7" tall, and is now in my kitchen making a bright splash of color for the season! Here's a card using the sketch from Sugar Pea Designs Mix it Up challenge #15. I love this sunshine sentiment and will never tire of getting it out and using it every year. This time I added a sunflower to it. Hope your week is full of sunshine - given and received! This year I've been enjoying adding an aqua blue to my fall colors, and I followed suit for my card again today. 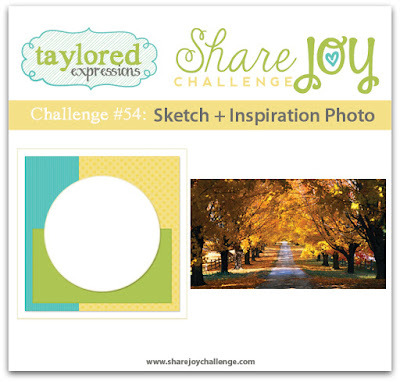 And yet ANOTHER wreath card, this time for the Taylored Expressions Share Joy challenge. I loved both the sketch and the photo inspiration - here's my entry. Fall and its delightful temperatures and sunny skies has finally arrived here - enjoy your day!! I received my Simon October Card Kit yesterday and dived in first thing this morning! If I'd designed a kit, this would be pretty close to it! I cut a stitched circle, then used the next smaller size of that set to lightly draw another circle inside as a pattern for my stamping. After stamping the brown leaf sprig all the way around, I could erase my pencil lines, and then add my other elements, using ink colors that matched the background plaid. This stamped circle was then popped above the rest of my card. Here's the amazing kit for this month - don't wait too long! We've been on vacation, and missed most of this month so far, so I am sliding in at the last hour with 2 cards for My Favorite Thing's "You Could Be a Superstar" card contest. For my first card, I took it as another excuse to use my Flashy Florals stamps and dies, this time with a fall feel to them. I started out by stamping the Flashy Florals using autumn colors. I liked them against this board design paper, and added some green leaves to the mix. Then for some pop, I hit upon using this periwinkle color. I stamped some tiny sprigs from Beautiful Blooms, and then added my sentiment to carry this color downwards, offset just a tad with some ivory to make it stand out better against the dark background. I stamped the background stamp once and then turned it 90 degrees and stamped again - I love the little pattern that emerges! Here's a fall card using my new September My Monthly Hero card kit, which has sold out. I'm SO glad that I grabbed this one when I did, as I love wreaths and this kit is all about wreaths and autumn! For my card, I used just 2 of the dies, along with a few embellishments, pairing them with one of the sentiments in the stamp set. Coincidentally, I saw the colors for this week at ColourQ, and used them for my first play with this set. Thanks for stopping by today on the first day of fall! Our theme this week is "Gift It! ", and the DT are all playing with Clearly Besotted products. I made a gift-card holding tag, and stamped some tissue paper as gift wrap. I tried putting an actual gift card on my tag, but the design just took away from my theme, so I substituted a rectangle of stamped gingham for now. The birds are popped up with foam squares, and the gift card will be nestled between them. Next I used another of the birds in this set and stamped all over a piece of blue tissue paper in dark blue and white. When it was dry, I used it to wrap a book, and added my tag. Books are often gifts we give to our Grands, and I know these little birds would please our munchkins. Briefly, you start with a white piece of cardstock, and clear emboss your image. Then sponge the entire panel with the lightest of your distress inks. LET IT DRY! (this is the hard part!) or the embossing powder in this next and following steps will stick where it shouldn't! Then clear emboss a few more images. I used a mask each time. Again, sponge the panel with a slightly darker ink, and repeat and repeat and repeat. I used 5 different yellows to reds. Since this is distress ink, at the very end, I splattered some water across the surface, and then blotted it up. LOVE how this came out! Lydia did a fancy cut for her design; I simply cut a scalloped rectangle from the center of my stamped panel, then framed it, added my sentiments, and popped it above what was remaining. The whole family likes to take "hikes" often, so I'm hoping that he'll like his card! Our theme this week is CAS: Clean and Simple, and the DT are all playing with CASual Fridays products. I find myself in an uncomfortable position this week - the stamp set I got to use this week has evidently now been discontinued, as it no longer shows up at Simon. I'm pretty sure that is the case, because I found a newer very similar set called Mistletoe and Holly, which would work at least for my first card. There is a bow on the mistletoe sprig - using a glue pen, I glued some twine right over the stamped bow. For my second card, I stamped the holly repeatedly in the center of my card base, masking the top and bottom. Then I added some red strips and a colored version of the holly. After I'd put all my elements onto my card, I felt it needed something, and so I added the little white dots by hand with my white pen. That really helped to pull everything together. 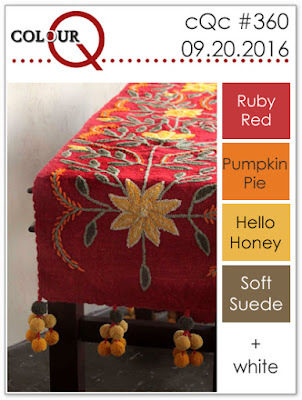 Sugar Pea's Fall Fox set would be perfect here, but I haven't been able to snag it so far - it's at the top of my wishlist. I'd like to throw my hat into the My Favorite Things Superstar contest. I'm feeling fall in the air! The ReRun challenge at Winnie & Walter this month is using their Renee's Leaves set, and I was wowed by all of the samples presented to us! I'll be making multiple entries for this one, but for my first, I was influenced by Heather's card. I'm a paper-aholic, so I was delighted to see her card that incorporated a pattern paper as a main ingredient! Heather started with a new piece of pattern paper, and that's where I started also. She used a bigger piece of vellum than I did, but I felt that covering up this design took away from the vibrant colors, so my vellum panel was added to the bottom third of my card. I stamped and copper-embossed the sentiments, and then was faced with how to attach it. After some thought I decided to stitch it on, but I was too lazy to get out my sewing machine, so I used a die to make stitching holes across the top and bottom and, using some gold thread, I hand-stitched it to my paper, adding a bow in the center of the top stitching. I liked the look of the copper so well, that I went hunting in my stash for some copper cardstock, and ended up trimming it into a little scalloped frame which I overlaid over the card front. To finish I just added some more sparkle with a scattering of sequins. 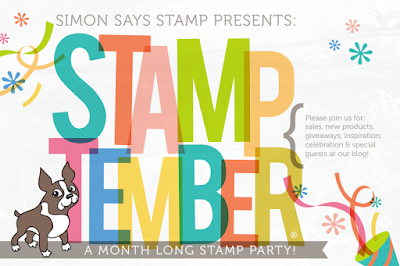 It's STAMPtember!! 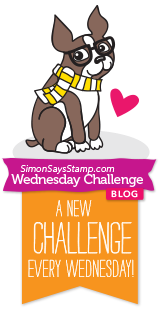 A very special month on the Simon Says Stamp calendar, and this week we are showcasing some of the brand new products being released this month! You may not yet have any of the new products, but we'd love you to use Simon Says Stamp Exclusives for your creations this week - our theme is STAMP IT! No digitals this week, please, we want to see you stamping! The Monday Challenge also has the same theme this week, so you'll have 2 chances at winning a $50.00 gift card if you enter both challenges! The design team were generously given some STAMPtember products to play with, and I've made 2 cards to show them off. supplies: white and green cardstock, red glitter cardstock, Believe die, Tim Holtz Festive stencil, and some distress inks, along with some red sequins. I'm not much of a colorist, but I had a ball deciding what these little penguins would wear to decorate their tree! There are lots and lots of sentiments included in this one! And hopefully you saw THIS POST at the beginning of this month, when I used the fabulous new Merry Christmas clear stamp. How would you like to win a fabulous Dream Craft Room Makeover AND lots of products?! Click HERE for more details on how to enter and to watch a video showing what you could win!! Good luck! Here's another stamp set from last year that I was finally able to add to my stash. This stamp may say it's for fall trees, and it works beautifully for them, but I think I'll be using it year-round, with greens for summer, and pinks for spring. The fact that it's a color layering set makes it super easy to make trees that look different every time! There are 5 different layers for the leaves, and you can use all of them, or just a select few. I think this would make a great card for everyone, and for many different occasions! I paper-pieced the main image with a tiny tone-on-tone heart and some woodgrain dp, then added some gingham washi and an xoxo die-cut trim to the bottom of a tag that I selectively trimmed the top from to make it just a stitched rectangle. After wrapping that panel in twine, I popped it above my card base. Thank you, Lawn Fawn, this set is adorable, and it will be used often! It doesn't look like it in my photo, but I got the idea for the blue sentiment from the same blues in the front panel. We are having a model day here - crisp, cool, and sunny; I am definitely feeling blessed! Hope you're enjoying your day, too! It's STAMPtember!! We're beginning an exciting month of brand new releases, fun collaborations, giveaways, and an AMAZING Dream Craft Room Giveaway! Generous Heidi sent her design teams some of the new Simon releases, and I wanted to share what I did with some of my new goodies! Be sure to visit the Simon Blog for all the details, and then hop over to the Simon store to see the new releases! There's a little something for everyone!